There’s been much coverage of the Islamic State’s (ISIS) executions of foreign hostages, but some U.S. officials are more troubled about the terrorist organization’s moves in Libya. Libya, along with Syria, were both swept up in the Arab Spring protests in 2011, which led to destabilizing civil wars. And Libya hasn’t really recovered since then. Several unnamed U.S. counter-terrorism officials told ABC News that ISIS is looking to expand and assert itself in Libya. “We have zero collection there and zero authorities there,” the official stated. The U.S. is still having difficulty in gathering intelligence or using its influence in Libya–which was long ruled by dictator Moammar Gadhafi–following the Sept. 11, 2012 attack on the consulate in Benghazi. “They’ve been preparing this for a while. A lot of them fought with ISIS in Syria and they’re coming back home to Libya,” Aaron Zelin, with the Washington Institute for Near-East Policy, was quoted by ABC as saying. And this view is shared by Libyan officials. Nayed said there’s between 2,000 and 3,000 ISIS fighters in the country. Nayed issued a more dramatic statement to AFP. 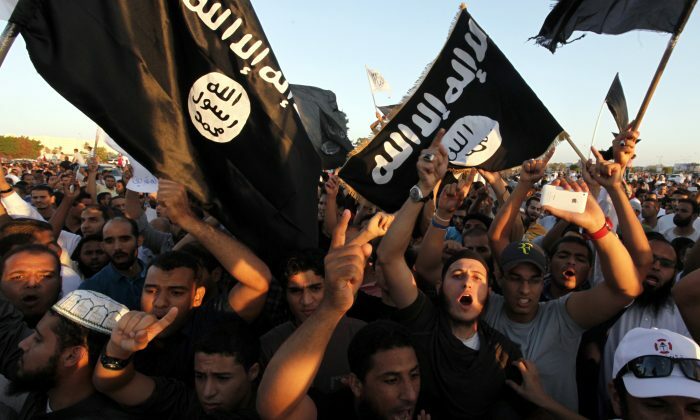 The Libyan militant group, Ansar al-Sharia, was blacklisted by the United Nations, because it has ties with ISIS. Nayed said the group has probably changed its name to maintain its ties with ISIS. Jordan's King Abdullah won hero points for planning to personally join airstrikes against ISIS—but turns out that's not the plan.